Gangster ‘epics’ are not films that merely present bad men doing bad things; on the contrary, the ‘epicness’ of the films are due to the ways in which producers tell the story within the wider context of the socio-cultural period, conveying a national uniqueness alongside the themes of brotherhood, betrayal, and the escalation of violence. While there are numerous contemporary directors such as Guy Ritchie, Francis Ford Coppola and Michael Mann that fit this paradigm, the most notable figure in this regard is the legendary Martin Scorsese who besets his conflicted protagonists with problems from all sides, masterfully building tension to a poignant crescendo. With Nameless Gangster (범죄와의 전쟁: 나쁜놈들 전성시대) writer/director Yoon Jong-bin (윤종빈) seemingly attempts to emulate Scorsese, featuring a similar rags-to-riches and fall-from-grace narrative structure. Yet there the comparisons end as while the story is distinctly Korean and multi-layered, and the directing competent, the lack of flair, tension and an over-abundance of secondary characters halt Nameless Gangster from achieving excellence. However, alongside the sumptuous costume and set design the film sports a fascinating perspective on the evolution of crime in Korea, and the struggle to combat corruption in contemporary society. In the month of October, 1990, President Roh Tae-woo launches a crackdown on corruption and crime in South Korea, giving the police and prosecutors special powers to arrest those involved in the criminal underworld. For the port city of Busan this presents an acute problem, and as gangsters are forced to lie low the incarceration of infamous Choi Ik-hyeon (Choi Min-sik (최민식) is an enormous victory for prosecutor Jo Beom-seok (Kwak Byeong-gyoo (곽병규). Yet the criminal simply refuses to admit any wrongdoing despite overwhelming evidence to the contrary. In order to fully uncover the truth, the journey must begin back in 1982 when Ik-hyeon was a mere corrupt customs official, exploring the relationships that were forged – particularly with notorious criminal Choi Hyeong-bae (Ha Jeong-woo (하정우) – during the golden age of the gangster lifestyle in Korea. Nameless Gangster is surprisingly less a film about gangsters and more a film about the evolution of corruption in Korean society, personified through smarmy central protagonist Ik-hyeon. Originating as a corrupt customs official, Ik-hyeon – and the entire customs department – are directly in the firing line of the government crackdown on crime, the penalty for which is placed squarely on Ik-hyeon’s shoulders. Yet despite being a dishonest and unscrupulous reprobate, Ik-hyeon is quite a charismatic and lovable rogue due to the performance of acting legend Choi Min-sik. Bizarrely Choi Min-sik exaggerates and overacts the character throughout the film but incredibly manages to convey this as part of Ik-hyeon’s personality, an appealingly silly man who constantly oversteps his boundaries to the chagrin of all involved. The subtly seductive performance blurs the lines between the gangster and comedy genres as Ik-hyeon simultaneously charms and smites those around him, juxtaposing laugh-out-loud moments with brutality, reminiscent of scenes within Scorsese’s Goodfellas from which the film borrows heavily. However these moments never quite achieve the shocking impact they should. Writer/director Yoon Jong-bin (윤종빈) writes the scenes incredibly well and has highly competent vision, yet somehow fails to capture the tension that such scenes demand, with the slow build of suspense and apprehension curiously absent. Violence, too, is also problematic within Nameless Gangster through the lack of escalation. While it would be absurd to expect Americanized gun crime within such a distinctly Korean gangster film the repetitive nature of the clashes, commonly involving baseball bats and glass bottles, quickly becomes bland and lessens the severity such confrontations should convey. Violence enters the narrative through the introduction of Choi Hyeong-bae, a lifelong gangster with whom Ik-hyeon shares common ancestry. 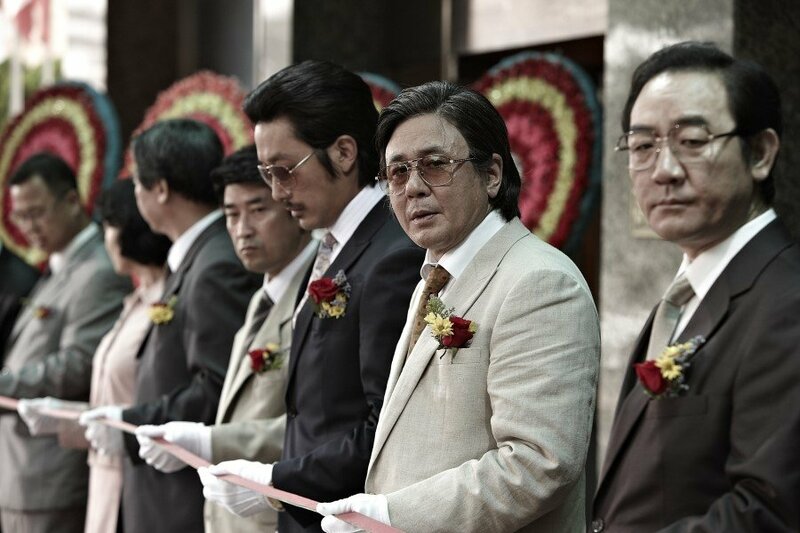 It is through their relationship that Nameless Gangster truly shines, as the bumbling Ik-hyeon forges ties with an incredible variety of powerful strangers due to mutual heritage – and seniority – in order to create a criminal empire, constructing a fascinating insight into the multifaceted nature of corruption in Korea. 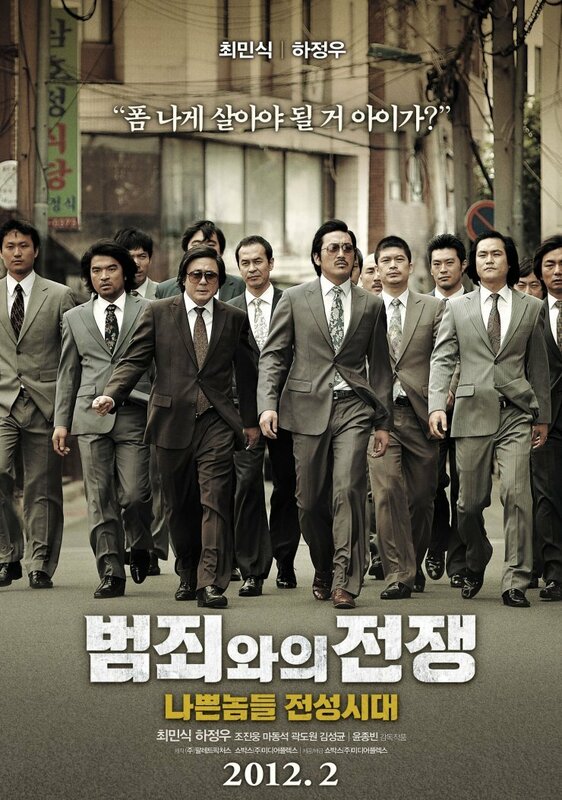 Director Yoon Jong-bin’s narrative strength lies in the comically awe-inspiring Ik-hyeon as he weasels his way into the good graces of politicians, law-makers and international crime syndicates, resulting in a meteoric rise from crooked customs official to one of the most dangerous gangsters in Busan. While Ik-hyeon provides the connections it is Hyeong-bae, wonderfully performed by Ha Jeong-woo, who commands the muscle. Hyeong-bae is stoic, authoritative and deadly, conveying restrained violence and potential danger with every movement and gesture, the true gangster of the partnership. The stark contrast between the two, as well as Ik-hyeon’s unerring manner for overstepping boundaries, provides the catalyst for the introduction of a third party in the form of rival gangster Kim Pan-ho (Jo Jin-woong (조진웅). In another nod to past gangster epics in the form of Scorsese-esque triumvirates, Pan-ho ultimately fails to be a convincing protagonist due to serious underdevelopment, undermining him as a credible threat both within the narrative and to consummate gangster Hyeong-bae. With a strong narrative and competent direction, Nameless Gangster also benefits from having sumptuous costume and set design. The world of 1980s Busan is eloquently portrayed and wonderfully realized, absorbing the audience within the chic decor and lifestyle from humble homesteads to bars to casinos. In terms of performance both Choi Min-sik and Ha Jeong-woo play off each other well, with the latter giving the stand-out portrayal as hard-boiled gangster Hyeong-bae. The stoicism of the character coupled with the restrained threat of violence is an absolute joy and contributes greatly in conveying tension, which is sadly underutilized within the narrative and direction. Choi Min-sik, on the other hand, is highly charismatic as Ik-hyeon despite being a tad overzealous throughout. The actor conveys the foolish nature of the man incredibly well, yet the scenes in which Ik-hyeon demands power and authority unbecoming to him that are the most revealing, conveying a man desperate for control in a universe which resolutely refuses him. The rest of the cast are used in supportive roles and are either generally underdeveloped, such as gangster Pan-ho and prosecutor Jo Beom-seok, or simply redundant, such as club Manager Yeo (Kim Hye-eun (김혜은) or brother-in-law Seo-bang Kim (Ma Dong-seok (마동석). This is unfortunate, as had the roles been greater (or jettisoned) the web of threat and deception would undoubtedly be much stronger as in Ryoo Seung-wan‘s The Unjust; as it stands, they are rather limp additions in an otherwise well-written screenplay about societal corruption. Nameless Gangster is a compelling and fascinating film about the nature, and evolution, of crime and corruption in Korea. With an absorbing narrative, wonderful set and costume design, and entertaining performances, the film is generally let down by the lack of tension and suspense, as well as underdeveloped characters. That said, Nameless Gangster is an enjoyable yarn of power and social relationships in a country still struggling to shake off the ramifications of the war on crime.